US car maker Chrysler has chosen Bob Nardelli, the former boss of DIY store Home Depot, to lead the firm. The move comes days after private equity firm Cerberus bought 80.1% of Chrysler for 7.4bn euros ($10.1bn; £5bn) from parent company Daimler. Mr Nardelli will act as both chief executive and chairman, while current chief executive Tom LaSorda is to be vice chairman and president. 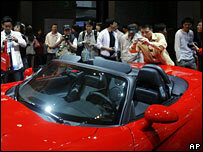 The new head said "the momentum of Chrysler's recovery" would continue. Chrysler - like other US car firms - has faced increasingly tough competition from Japanese firms, that have developed smaller, more fuel efficient models. The appointment comes as part of a wider reorganisation plan that is set to reduce the workforce by 13,000 in the US and Canada by 2009. "Bob has a proven track record of success and an unwavering focus on performance, and brings deep operational experience and a broad industry background to Chrysler," said Mr LaSorda. "His background in operations will provide valuable knowledge as we continue Chrysler's turnaround," he added. During Mr Nardelli's time at Home Depot, the firm expanded rapidly overseas and saw profits rise, although market share at home in the US slipped. But Mr Nardelli ran into criticism for the size of his pay - about $225m a year by the end of his tenure - and for appearing high-handed when shareholders wanted to question him about it, leading to a sharp fall in the company's share price. A huge severance package negotiated when he left the company in January added to the furore over executive pay. Chrysler is currently in talks with the United Auto Workers Union (UAW), over pay and benefits for its staff.